The Toledo Swiss Singers have a busy end of the year. Follow along and contact us with any questions. Regular rehearsals continue on Wednesday nights at 7:30. Rehearsals begin for February's Murder Mystery. There are also rehearsals for Singers going to Hayes Presidential Center. Deadline for Carruth orders. 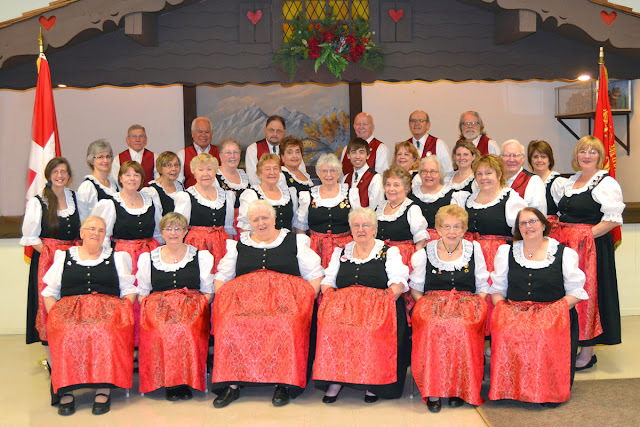 Make check out to Toledo Swiss Singers. Give your orders to Roberta. Candy sale by Ron Beltz. Contact Barb Carr to order ahead. Or you can buy what you want that day. Holiday Party for Signers at director's house. Bring appetizers, main dishes, sides, or desserts! Cookies for our host, too! We eat around 6 p.m.
Christmas caroling at the Hayes Presidential Center from 5 to 8pm. Singers will be inside the house on the second floor. If you would like to hear some music to get into the holiday spirit, there are several opportunities for you to do so. Terra Community College Music Dept is presenting their Christmas concert this Saturday, Dec 1 at 7:30 PM at the college in Fremont in Bldg C. Being featured are the Terra Choral Society, the Brass Choir and a Fusion Ensemble. Mary Ann Hotz is in the chorus and Al Amstutz's grandson is playing in the percussion section. This is a free admission show. Come and get into the holiday spirit. 99th performance of Handel's Messiah at Rosary Cathedral, starting at 4 p.m. SOLD OUT! Mary Ann and Barb Carr are in the chorus! Teutonia Chor Christmas dinner and concert. Ask Brenda or Marilyn for details. Toledo Choral Society's Christmas concert at Gesu Church, starting at 3 p.m. Bring a nonperishable food item for admission. It is also being recorded for broadcast on WGTE public television!